I love Siri. I use her on my daily bike ride to work, asking her what time it is. I use her while driving to text my wife and read incoming messages. I’ve asked her where the closest bike shop was, and use her to find all sorts of interesting info. But there’s a piece missing from the experience. Maybe it’s me just being an engineer. Hi, I’m Cliff. You’re here because you’ve noticed something missing from Siri but you can’t quite put a finger on it. I’m here to explain what that piece is. Yesterday I asked Siri to set an alarm to remind me when to pull the lasagna out of the oven. I believed I had the alarm set properly but when it went off the lasagna was far from cooked. It needed 1 hour and 55 minutes and I started to wonder if Siri only caught the 55 minutes part of my earlier request. I wanted to go back and see when I had asked for the alarm to be set and that’s when it hit me. Of all the conversations I’ve had with Siri, (some loony and ridiculous) I’ve never bee able to go back and recall or check the times that they were held. Conversations between me and Siri seem to roll off into the abyss. I believe that much like the web browser there is a case for history in Siri. I Binged and Googled for an answer and I even went as far as Yahoo but I couldn’t find a way to lookup old conversations between myself and Siri. Maybe after this year’s WWDC? I was watching this argument between a man and his wife happen with Siri trapped in the middle when it dawned on me. I still didn’t know how to get Siri to “tell my wife” about things happening throughout the day. Hi, I’m Cliff. 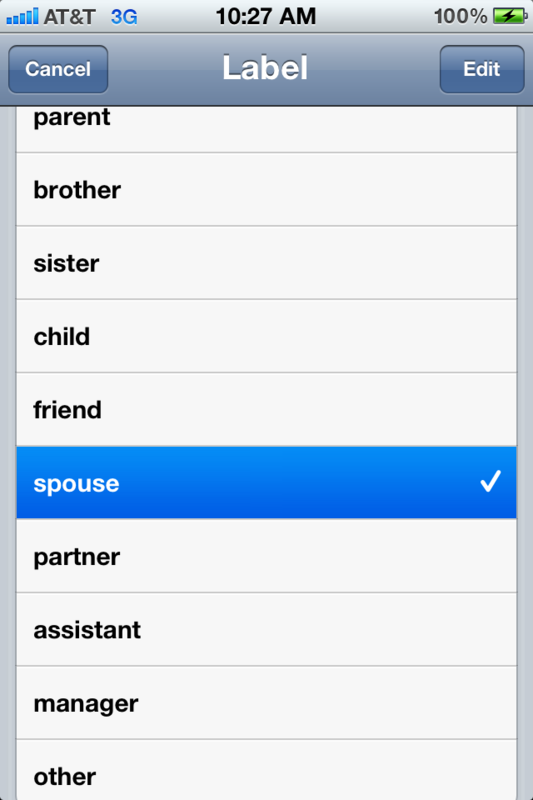 You’re here because Siri doesn’t know about your spouse or significant other. Don’t worry, it’s not difficult to teach her about the individual members of your family. I had much more trouble trying to get her to understand how I pronounce my wife’s name since it is not spelled the way it sounds. I cover all of this in today’s article. To start, I went into edit mode on my Wife’s contact card and started fiddling. Eventually I noticed the “add field” button. Tapping this brought up a host of different things I could associate with a contact, most notably the “Related People” button. 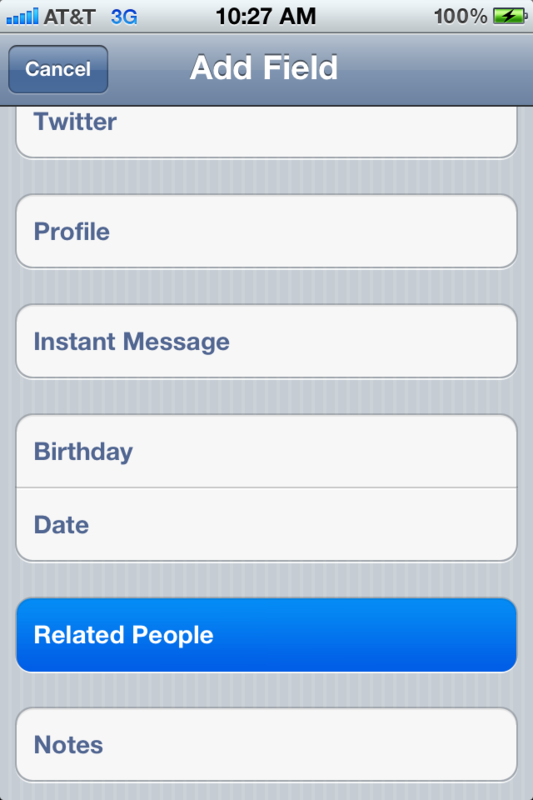 Tapping on “Related people” adds a custom relationship to a contact. I assigned a spouse relationship to her contact and linked it to my contact info. That got me thinking. How does Siri know who I am? After all, my contact info is just another card in my address book. There is no “me” card. 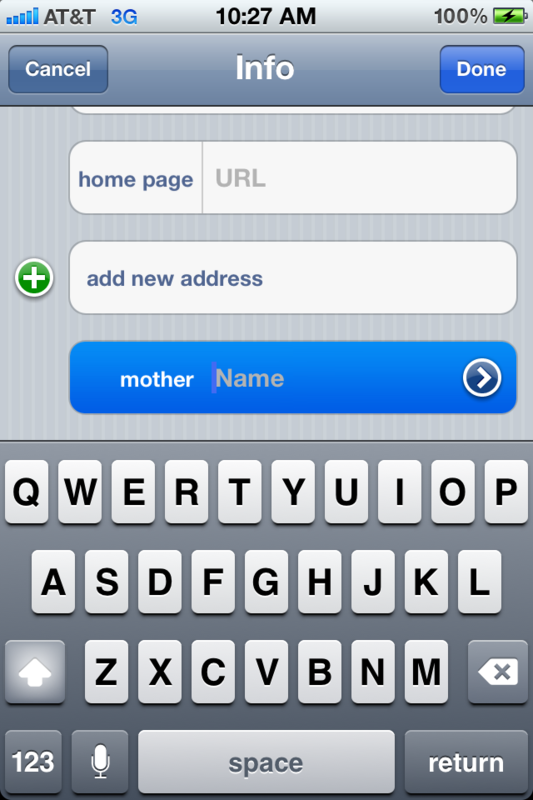 I backed out of the address book and went into settings under general and found the Siri settings.